Origin Instruments is pleased to deliver the first switch-based access solutions for Amazon’s popular Kindle electronic book readers. Our PageBot for Kindle products enable the independent reading of books and other long form documents by people who cannot hold the Kindle or press its buttons. PageBot combines a secure and adjustable mount, dual integrated actuators for the Kindle Next Page and Previous Page buttons, and a built-in intelligent drive circuit that can directly interface to a wide variety of adaptive switches. With PageBot, reading on the Amazon Kindle is accessible to people with motor disabilities that might result from birth defects, spinal cord injury, ALS, cerebral palsy, muscular dystrophy, spinal muscular atrophy, multiple sclerosis, stroke, arthritis, or repetitive strain injury. PageBot provides a much more compact, reliable, and cost effective solution for long-form reading than legacy mechanical page turners for paper books. PageBot integrates multiple interfaces for adaptive switches that can suit the preferences and abilities of individual users. Standard mechanical adaptive switches with 3.5 mm microphone-style connectors, like the button switches available from Origin Instruments, can be plugged in directly. Dual switches, like the Origin Instruments Sip/Puff Switch, can interface with a single stereo cable. PageBot is also compatible with a wide range of adaptive switches that are available from other assistive technology suppliers. In addition, a USB host interface is provided so that PageBot can be operated from the buttons of a wired or wireless USB mouse. PageBot captures the Kindle in a grip of compliant foam that helps prevent scratches and enhances resistance to mechanical shocks. PageBot is delivered with an adjustable mechanical mounting arm that is articulated in four degrees of freedom. The mounting arm includes an integrated adjustable clamp that supports hard-mounting to table tops, shelves, or cylindrical rods of up to 36 mm diameter. PageBot also incorporates a standard 1/4-20 threaded insert for use with tripods or other special mounting hardware. PageBot has very low quiescent power consumption and can be powered from the standard Kindle power adapter or from an optional rechargeable USB battery pack. 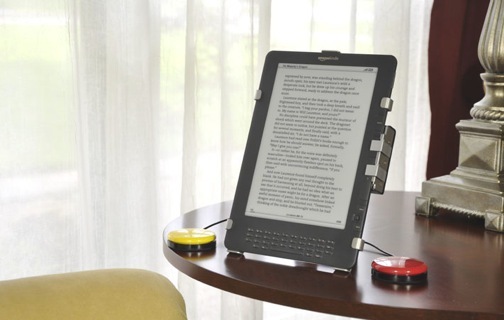 PageBot includes an integrated Keep Awake mode with an automatic timer that can optionally prevent the Kindle from entering sleep after a period of inactivity. This feature eliminates the need to manipulate the Kindle power switch after a pause in reading. PageBot is available in three different models. PageBot for Kindle DX and PageBot for Kindle 2 are both available for delivery from the Origin Instruments online PageBot Store. PageBot for Kindle 3 will be available in June 2011. Amazon’s Kindle and needed adaptive switches are available separately.